In audiophile tweakdom, there's black boxes aplenty. This generic term usually refers to both literal as well as conceptual darkness. You see, most of these devices are black. To boot and more often than not, their exact inner workings remain clad in proprietary or patent-pending mysteries. Depending on psychological polarity, this tends to exude powerful magnetism. It either attracts curiosity and subsequent over-the-top endorsements (who doesn't love a good mystery that can't be disproved); or it repels minds of scientific bend for the same reason - if designed elsewhere while not exhaustively documented to turn open secret, how could it possibly perform, be based on solid engineering? Add to this scintillating scenario the audiophile propensity for wanting strange and unusual solutions to work - anything to get better traction on the slippery slope to perfection. A certain sector of specialized products thus often finds itself under intense scrutinity, one that's made up of equal parts doubt, condescension, hope and fear. Clearly, fearless Akiba-San of Japan's Infra Noise Laboratory is no stranger to these dark waters. His products under the Ortho Spectrum umbrella all take paths less traveled. Today's colorful single-rack space, full-width components with integral professional rack-mounting ears are active filters that insert into the signal chain pre- and post D/A conversion. The respective "digital" and "analogue" nomenclatures clearly point out which goes where. Common sense immediately recognizes - what? 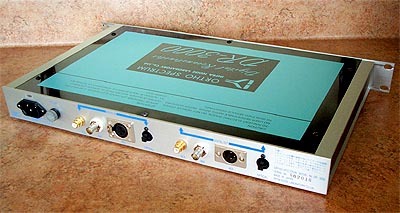 The DR-3000 requires a stand-alone DAC from which to derive a signal - it operates purely in the 1s/0s domain. Two aft-facing banks of digital i/o ports with four connections each support all popular interfaces: RCA, BNC, XLR and Toslink. The front panel accomodates input selection via a stepped rotary switch and toggle-fitted 0/180° phase, filter/bypass and power/off. 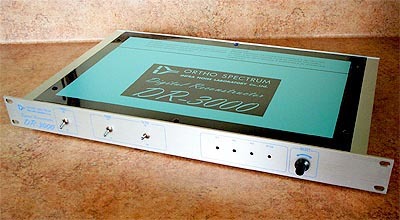 The ability to take the DR-3000 out of the loop with the flick of a switch would be a convenient reviewer's boon. 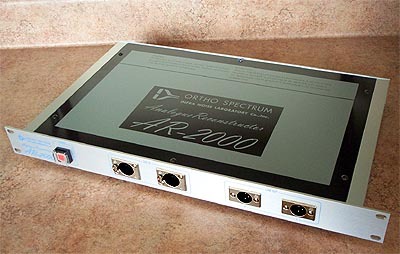 The companion AR-2000 piece duplicates the RCA and XLR i/o provisions in the analog domain, with the former conventionally on the rear panel, the latter unconventionally on the front. Resin top and bottom plates on both components minimize exposure to chassis-induced magnetic field disturbances, a smart detail that parallels Denis Morecroft's research under the British DNM marquee (soon to be introduced to the US via Resolution Audio's new integrated). Three strategically glued felt dampers underneath provide mechanical interface with equipment rack shelves if mounting via the ears were not feasible. So far so obvious. What's inside these boxes so dapperly trimmed with wooden strips on their sides, their happy colorful caps so clearly in defiance of the black box mantra? That's less clear. Ditto for exactly how they do what they do. The 'what' would clearly be my job as today's master of ceremonies. The 'how' took sneaky refuge in the domain of 'don't ask, don't tell'. Opening the boxes additionally voids the warranty. Hmm. What I could unearth? 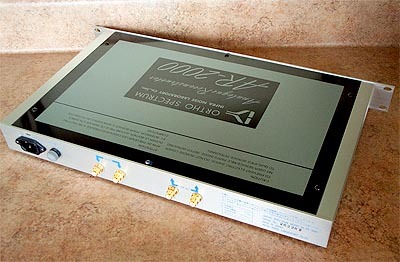 The AR-2000 works as some sort of enhanced analogue low-pass filter which incorporates ultra high-speed opto-coupling. This presumably purifies the post-conversion analog data stream from ultra-sonic contaminants. The accompanying owner's manual suffers too much in the English translation to be even marginally educational, the absence of a proper Infra Noise Labs or Ortho Spectrum website adding only further frustration. Suspicious that this scarcity of documentation is by design? I couldn't really refute such notions with any evidence to the contrary. It's clear however that the designer believes the AR-2000 to belong into professional mastering facilities, to reintroduce what he feels to be sonic advantages of pre direct-to-disc analog tape masters. The professional provisions (XLRs, rack ears) further point at such intended recording industry employ.